The University of Tampa’s MBA program — Creating Value for Graduates, Organizations and Society — helps students develop the sophisticated strategic mind-set demonstrated by successful executives. UT’s MBA program is one of the largest, most established and most exclusive in Florida. The University of Tampa’s MBA program is offered in three convenient formats: •The Full-time/Day program is designed for accelerated completion with a group of peer students. Full-time/Day program students can complete the program in as few as 12 months. •The Part-time/Evening program is designed for students who work full time jobs and need to complete the program at their own pace. Students who attend part-time can complete the coursework in as little as two years. •The Executive MBA program is designed for professionals with seven or more years of work experience. Classes are cohort based, offered every other Saturday and allow completion of the program in 24 months. Admission to the full-time and part-time MBA programs at Sykes is based on undergraduate work; GMAT score (a minimum score of 500 is required); demonstration of proficiency in mathematics, computers, and written and oral communications skills; and professional experience. International students must demonstrate proficiency in English by scoring at ...Admission to the full-time and part-time MBA programs at Sykes is based on undergraduate work; GMAT score (a minimum score of 500 is required); demonstration of proficiency in mathematics, computers, and written and oral communications skills; and professional experience. International students must demonstrate proficiency in English by scoring at least 577 on the written TOEFL, 230 on the computer-based TOEFL, 90 on the Internet-based TOEFL, or 7.0 on the IELTS. Admission to the Saturday MBA program requires relevant work experience; applicants are required to have five years of relevant work experience, including two years in a management position. Applicants to all programs must submit two letters of recommendation, a resume, and a personal statement. UT’s Office of Career Services provides Sykes MBAs with a battery of services, including assessment tests, workshops in business etiquette and business dress, one-on-one coun­seling, and job fairs. Students here praise “the professors’ desire to help students obtain careers after graduation.” Attendees of a recent on-campus career fair included ADP, Central Intelligence Agency, Chase Retirement Services, Deloitte, Franklin Templeton Investment, Geico, New York Life Insurance Company, Raymond James Financial, Syniverse Technologies Inc., Target Corporation, T. Rowe Price, The Nielsen Company, U.S. Department of State and USAA. 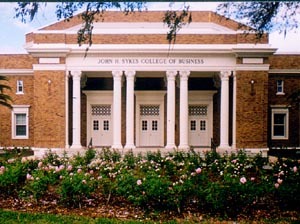 The John H. Sykes College of Business is accredited by AACSB International---The Association to Advance Collegiate Schools of Business. The university is also accredited by Southern Association of Colleges and Schools to award associate’s, baccalaureate, and master’s degrees. The university was founded in 1931 by visionary community leaders who wanted to provide the best possible educational opportunity for their community. The graduate business programs at The University of Tampa prepare students for leadership responsibilities in a technically sophisticated, diverse global environment where change rules. Karen Surplus - CFO, DNAprint Genomics, Inc.
Want more info about University of Tampa, Sykes College of Business Executive MBA? Get free advice from education experts and Noodle community members.